I have eaten far, far too many brownies in the last couple of weeks. Far too many. I started forcing my neighbours and the people at my husbands office to eat brownies and give me feedback because you can only eat so many brownies before they all start tasting the same. I got a little sick of chocolate this week. Pigs must be flying because I honestly did not think that those words would ever come out of my mouth. Or, you know, be typed. But I was bound and determined to make these brownies work. With cheesecake. Cherry cheesecake to be exact. And they needed to be chocolatey and cheesecakey and amazing. Not too much to ask, I don’t think. Except that I also needed to use lentils. You weren’t expecting that right? Either were all the people I foisted them on. But they never knew, so don’t worry, these taste like cherry cheesecake brownies, not like lentils. You can’t taste the lentils at all, they essentially replace the flour in the brownies. All you taste is chocolatey cheesecake deliciousness. Yes. These are, in a word, amazing. Trust me. And since there’s lentils in your brownies, you can basically call them a health food. Right? Lentils must negate the butter and oil and chocolate and sugar. I’m sure of it. They’re a superfood with all sorts of fibre and protein so that totally makes up for the rest! Okay, I’ll admit that these aren’t healthy, but they ARE definitely healthier than brownies made with flour, so that’s something. I’ll take it. 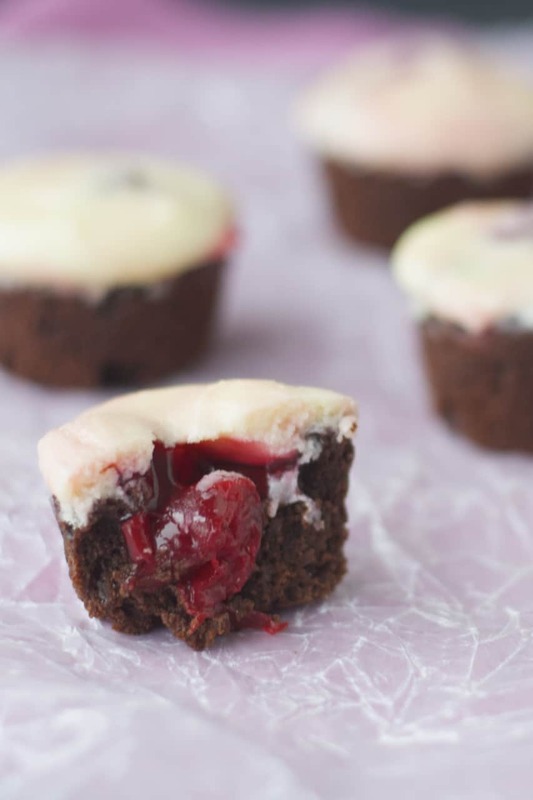 Cherry cheesecake brownie bites anyone? I have lots of them. And they’re delicious. I’ve entered this recipe in the 2015 Lentil Recipe Challenge. Part of the judging process is based on popularity of the recipes on their Pinterest board. I would love it if you would go here and repin my submission to help me out in the contest! Thanks! Preheat the oven to 350 degrees F. Lightly spray a 24 well mini muffin tin with non-stick spray, I used one that was dark non-stick metal. In the bowl of a food processor, pulse the cooked lentils until they are finely chopped. Add the egg, vanilla and oil and puree until the mixture is smooth, scraping down the sides as necessary. Make sure you puree it long enough, or the texture of the brownies will be grainy, it will take 3-5 minutes. Melt the butter, either in the microwave or in a small saucepan on the stovetop. Remove from the heat and stir in the chopped dark chocolate. Stir until the chocolate has completely melted. Add this to the lentil puree and mix in the food processor until well combined. Add the sugar, salt, cocoa powder and baking powder and mix well. Fold in the mini chocolate chips. 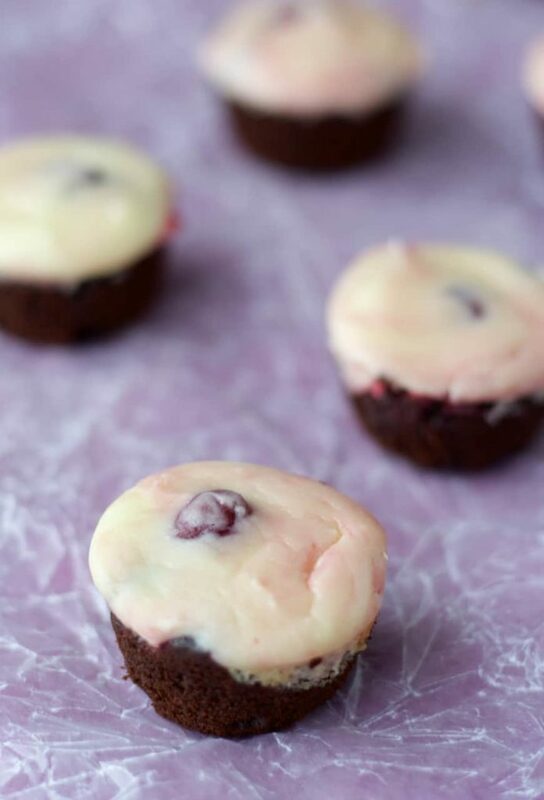 Scoop the brownie batter by the teaspoonful into the mini muffin wells, dividing it equally between the 24 wells. Using a spoon, spread the batter in each well so that it covers the bottom and then goes up the sides a little bit, making a slight well in the center of the batter. Place a cherry into each well. In a medium bowl, with an electric mixer, beat the cream cheese, sugar and egg yolk together until smooth and well combined. Swirl in 1 tablespoon of the cherry pie filling (just the liquid, no cherries). Divide this cheese mixture between the 24 muffin cups, about a teaspoon of cheesecake on each brownie. Smooth the cheesecake filling out to cover the brownie and cherry underneath. Bake for 11-13 minutes until the tops are dry and just set. Do not overbake or the brownies will be dry! Let them cool completely in the muffin tin, then store in an airtight container in the refrigerator for 3-5 days. Amazing! I can't wait to make these. Say, do you think little cupcake liners would work? Just wondering- I have a sweet collection of pretty little liners! Thanks Monica! I would imagine liners would work just fine - I don't have the patience for the little mini liners though - they always move around as I'm trying to fill them! But if you have the patience for it, go for it! :) There isn't much oil in the brownie base though, so they may stick a bit, but it might be fine - I just lightly sprayed my muffin tin and they came out fine. Hope you like them! I used mini liners, and they came out perfectly! I think this is so cool!!! It never occurred to me to stuff lentils or anything similar into a baked good. I guess I have heard of beans in brownies though, and apparently they taste pretty good. These little nuggets look amazing!! So creative! Thanks so much Sarah! The black bean brownie phenomenon was actually what made me think of it - I figured if black bean brownies could be good, why not lentil brownies?! Thanks Sarah! Okay I love that there are lentils in these!! That's kinda awesome - they look delicious! haha oh gosh and I know that exact feeling. You've made something so many times to get it just right but it all starts to taste the same after awhile and you can't tell if it's different or better or not! Exactly! It was all just the same after a while! Thanks Ashley! NO. WAY. There are lentils in this?? I never ever would've guessed! They're so pretty and fudgy and that cheesecake and cherry combo looks like the bomb. You nailed these Stacey! Cherry cheesecake is one of my favorites! I love that you've combined these heavenly flavors with brownie and lentils! Pinned! Wow this is a great idea! Plus making them bite sized only makes them more addicting. Exactly! Bite size just means you can eat more, right?! Thanks Shelby! These look gorgeous, Stacey! I love that they are flourless too, the lentils is such a creative idea! Wow, you used lentils? It's very impressive. I just have to wrap my mind around it! haha, kind of like the black bean brownies that were so popular a while ago! You can't taste them, promise! :) Thanks Mir! This is very creative Stacey, what a wonderful idea to use lentils in there! These look amazing! Seriously! Cherry cheesecake is one of my faves :) Can't believe you snuck the lentils in there! Cherry cheesecake is definitely one of the best desserts going, especially when it includes chocolate! Thanks Ashley! We had absolutely no idea they were made with lentils!!! I will definitely be making these as everyone here loved them! Thanks so much Louisa! And thanks for letting me foist them on you unsuspectingly! :) Glad you liked them! I've never seen anything like this, Stacey! I love your creativity. The fact that they are flourless make them even more perfect! Wow, these look fantastic, Stacey! 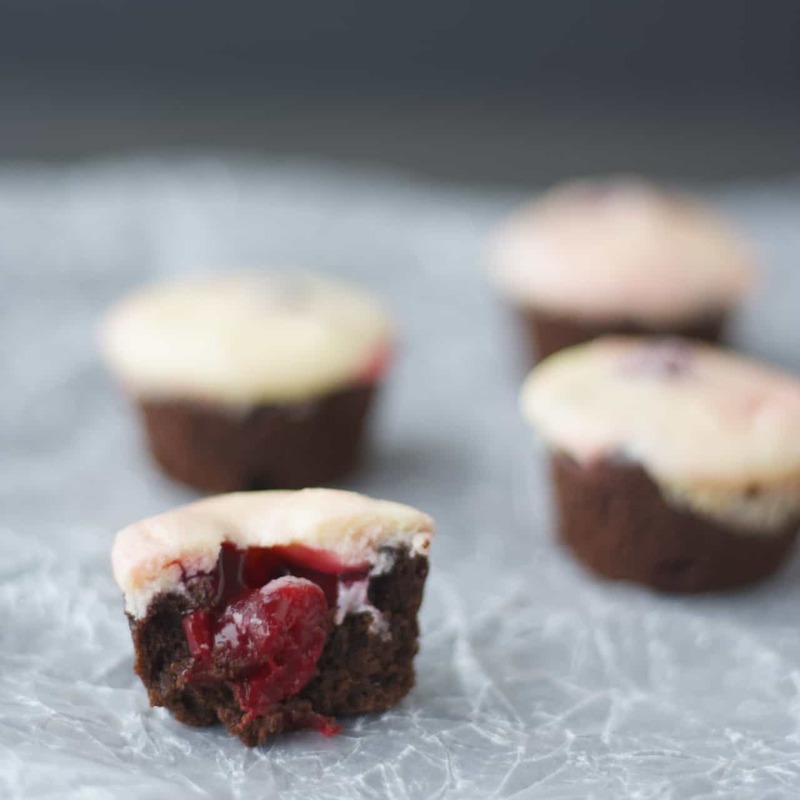 I love that this is a cheesecake brownie bite! And even better that they're flourless! Pinned and can't wait to try out! Thanks so much Gayle! Let me know if you try them!